Ask fellow campers about "Sunset Point RV Trailer Park" and nearby attractions. Very relaxing scenery, sites with cable are waterfront. Sites are very close together, but the park wasn't busy so we were spaced out. Cash or personal check only, no credit cards. We camped at Sunset Point RV Trailer Park in a Travel Trailer. We looked at our stay as checking off a bucket list item, to park our RV looking out over a bay/ocean. We stayed 7 nights. When you reserve they require no down payment and ask for cash or check when you arrive. 34.28 a night, stay 7 get a discount. Showers are very clean, plenty of hot water. Restrooms are very clean and there is an outdoor sink for doing dishes with hot water. Dump station is available. My Campsite at #21 was facing the Johnson bay, we pulled in instead of backing in. It doesn't matter how you place your RV, trailer, or 5th wheel, its a tight fit. The advantage is you can see the bay out the front window, you will need to shut your curtains on each side for privacy. All your outdoor business is in front of your rig, table and fire ring, so as long as you can squeeze out your door to go down front it can work. You will need to level. The next row after the waterfront row is close as well with their tables and fire-ring across the road by the bay. They also can look at the bay from their front window. Wifi and cell are good and att had 1-2 bars Dogs were barking in campers that have been left for the day. There were 2 big dogs from the surrounding neighborhood running in the campgrounds each day, and they were all over you if you were outside. I noticed people with string lights and outdoor lights on all night. As you are parked very close to each other, porch lights should not be used. Even with dark window treatments, it felt a bit like downtown New York's bright lights. We did hear our neighbor snoring. There is an ornamental light house with lights blinking 24/7. Owner was burning trash, old furniture, and old engine oil twice while we were at the campground. It made sitting outside impossible with the smell the first night. Laundry room had nice facilities. It is windy enough that using an awning is a disaster, we observed several campers with slides that had awnings attached, retract them due to the wind. One had one rip and he taped it until he could get it replaced. DO NOT arrive before noon as there is little room to wait for your spot to open up. We did have to wait until almost 1 before the people in our spot left. The manager was very good about information on local restaurants, hiking and sights to see. Firewood 3.00 large bundle. This is a very small campground. I would not return due to dogs running loose, loose,unattended dogs barking, tight sites and burning trash and oil. We camped at Sunset Point RV Trailer Park in a Motorhome. Traveling in a 38 foot coach we stayed 7 nights in a site for big rigs (site 12). This park has power and water but no sewer. There is a dump station located by the office, or for $10 per visit, they will provide a mobile service. All sites are grass/dirt and at a slight incline towards the water. This means you will have to block-up one side of your coach (north side). The closer the site is to the water, the greater the incline. No trees here so satellite worked great...which was good because the wifi was spotty. Sites located in the middle of the park are cramped together. But, each of these sites has a fire ring and picnic table located directly across by the water. People really love this park and spend their summers here every year. And, when you experience the beautiful sunsets, you'll understand why. We really lucked out as site # 12 is the best site in the entire park (although it has a bad incline). It has the best view plus is the most spacious. We stayed here over the 4th of July and watched three different fireworks displays from across the bay. It was fantastic! If you are looking for a quiet and clean park where you can sit outside and relax...go here. We enjoyed our stay, and would go back. We camped at Sunset Point RV Trailer Park in a Motorhome. What a lovely park. We had site 29 which was in the end. We parked headed in and ran water and electric under the coach for a lovely waterfront view. Good 50 amp, no sewer BUT this is the only park I've seen that has portable tanks for you to borrow to dump and then take to the dump station. They also will provide lobster pots and propane heaters. Sites are a bit tight so we were glad to have the end. The lady in the office was so helpful with things to see and restaurants to try. She really made our stay one of the highlights of our trip. Would definitely stay again. We camped at Sunset Point RV Trailer Park in a Motorhome. Dont miss Quoddy Head State Park. Beautiful views Nice hiking. Dog Friendly. Pretty lighthouse with Easternmost point in US. Don't forget your passports and visit Campobello island. See FDR summer cottage and Tea With Eleanor is an absolute must do. Free tickets at visitor center. 9am ADT. Great park. Beautiful setting. We were in site 12, which the door side of our fifthwheel faced Johnson Bay. Great owners, manager and host. If you want to have lobster, the park will bring you the pot, cooker, propane and utensils for the event, and tell you where to buy the best lobster. I had a plumbing issue and, after trying to solve myself to no avail, the owner personally fixed it for me. They also have added 50amp service. We will definitely be back. We camped at Sunset Point RV Trailer Park in a Fifth Wheel. Be sure you have plenty of supplies, food, water etc., because there isn't a whole lot in the town of Lubec. Be sure to do the Whale watching tour and go to Campobello Island. Be sure to have your passport for getting onto Campobello Island. Grass pad, tight spaces, gravel roads. We parked the motorhome straight in and managed to hook up to the pedestals that were in the front by running everything underneath. This afforded us a constant water view. But, this arrangement also brought you very close to your neighbor. We set up our chairs in front of the MH which was a spacious area. There is a large spacious grassy area on a hill behind the sites which was great for walking pups. I also walked them up the road to the entrance. Honey wagon service available ($10 per tank) or use their blue tank for free and do it yourself. Wi-fi was good and we had 80 cable channels. This was our main destination CG and we stayed 13 days. We made reservations six months prior. Staff was cordial and helpful. We camped at Sunset Point RV Trailer Park in a Motorhome. c is a few blocks long with a few shops, hardware store IGA, marina. Campobello Island, Canada is only a few miles away. Franklin Roosevelt's cottage. The drive around the island is scenic. Eastport is touristy with many shops and restaurants. Interesting marina where at low tide you are looking down at the boats. Calais has a Walmart. West Quoddy Lighthouse has a nice walking path with scenic views of the water. Cobscook Bay State Park boat launch was a great area to take the pups swimming. This facility is easily reached and any updated GPS will take you right to the front gate. But be forewarned, there is extensive construction on Route 1 the closer you get and other sections are rough and uneven. Just take your time and you will be rewarded with a fantastic place to stay. The entrance road is paved and leads directly to the office. The office had lots of books and DVD's, and a kind and helpful host. The roads in the park are very easy to navigate and there is absolutely no tress to snag your rig. There is no separation between sites - maybe just enough to get your awning out. But don't do it - the wind never lets up which is great for keeping the bugs away. For a fantastic view of the bay try to get a site between either 7 t0 12 or 17 to 24 - the later only has cable. If you pick a later spot be sure to pull in frontward and run your hook ups under your coach to the pedestal. We were in site 20, grass, perfectly level. The showers/bathrooms very clean. Very quiet at night. We really enjoyed our 7 nights here. Verizon worked quite well. We would return. We camped at Sunset Point RV Trailer Park in a Motorhome. Excellent location for visiting West Quoddy Head Lighthouse and Campobello Island. The center pull throughs need to be angled, since there's not enough room to turn and pull in straight with the spaces being so close together. This is the first time our RV has ever been hit by another RV trying to turn into their spot. And sites are a little more than an awning width apart. But, we weren't here for "camping", so it was fine. Their wifi was good when you could see it. Our Verizon and T-Mobile phones were on roaming, thinking we were in Canada and our Verizon mifi was weak, but usable. Nice grassy spot, mostly level. Beautiful view of the water from the point, very quiet area. We camped at Sunset Point RV Trailer Park in a Motorhome. Our spot had a lovely view of the bay, and the shore trail provided beautiful views, including sunsets. Adorable office had lots of books and dvd's, and a kind and helpful host. Very quiet and peaceful - off the beaten path. We camped at Sunset Point RV Trailer Park in a Travel Trailer. Beautiful small park outside of Lubec. Immaculate restrooms, friendly people. A bit tight as sites are very close together but do-able. All utilities worked great. We camped at Sunset Point RV Trailer Park in a Motorhome. Wonderful small campground in a great location. Many of the sites are very close together, somewhat designed for buses. However, if you have a short RV (about 20 feet long) or a tent you can score a great site. For a short RV, sites 12A and 12B give you a larger spot overlooking the water. The staff is amazingly friendly! The showers/bathrooms very clean. They supply lobster pots with propane burners for free! Very quiet at nite. A bit of shore to walk along. We really enjoyed our 3 nites here. Verizon worked quite well. We paid $35 per night Make sure to bring your passport - go to Campobello Island and do not miss a visit to East Quoddy Light House - a unique walk to lighthouse only at low tide. We camped at Sunset Point RV Trailer Park in a Motorhome. Make sure to bring your passport - go to Campobello Island and do not miss a visit to East Quoddy Light House - a unique walk to lighthouse only at low tide. First, be aware that there are two Sunset Point named RV campgrounds with only a minor difference in name and only about 50 miles apart. This one, near Lubec is well situated near Campobello Island and has a beautiful view. Very crowded feel. The sites are very narrow with our 38' 5th wheel barely fitting to open the slides and only so with our long bed tow vehicle tucked under the nose. The picnic table and fire ring is in front of the site and across the access road. I tried to park next to the table as it was too chilly to sit outside and was told in no uncertain terms by the manager that wasn't allowed. No sewer but an off camber dump station that was tight to access, wifi was down for a day then spotty when it worked. On a more positive note, we were given an excellent area rundown of things to do and go and places to eat. We camped at Sunset Point RV Trailer Park in a Fifth Wheel. This is far from a 'bad' CG but be aware that there are some considerations if you are in a 'big rig' or need instant communications A trip to Campobello Island and the FDR home - but it is in New Brunswick, so will need your passport. Fun little campground that can claim being the easternmost campground in the US. Management is responsive to needs to the degree of providing the burner, pot, trays, and utensils so you can cook lobster at your site. While they do not have fhu sites, the manager will empty your black and gray tanks for $10 or you can borrow the honeypot and do yourself for free. All sites are water front/view. Seals are sunning and playing in water. Bald eagle flew right over our coach. Magnificent. Had trouble managing AC/heat and microwave. Their paperwork states they reserve the right to reduce usage due to overload. Coaches need to pull in forward to take full advantage of the water views but that means the utilities have to be pulled under that coach. It also means that the result is confusion with coaches being too close to each other trying to get to the pole and faucet. Management needs to provide guidance on where on the site to park based on the RV coming in. Coaches needs to be parked differently than 5ers and tt. Tents have their own area. Would come back. We camped at Sunset Point RV Trailer Park in a Motorhome. Don't miss the Little River Lobster Co in Cutler, ME, for live lobster (soft shell at $4.50/lb, hard for $7.50/lb). Don't miss the Bar Harbor Soup Co also in Whiting. The Quoddy Head State Park has a super hike over cliffs and through the forest. Very pretty and rated moderately challenging though I found it quite challenging. Several lighthouses in the area to view and the Campobella Island has 2 lighthouses. What a wonderful place to watch the sunsets! Sitting at the northeastern most tip of the U.S. This park is a gem. The owners are very friendly and helpful. The restrooms, showers and laundry were immaculate. We camped at Sunset Point RV Trailer Park in a Travel Trailer. Fantastic location to visit Campobello Island. Don't miss Monica's Chocolates across the road from the entrance-THE best chocolates ever!!! 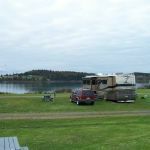 This is the only rv campground with hookups in Lubec. The sites are water & electric. They mostly level, very close, grassy sites. There are pull-thru and back-in sites. Central dump station near dumpster on exit. The single loop road is gravel. It can be a bit tight getting into the sites because the sites are so close together. Tow vehicles must be disconnected as the sites are too short to fit a towed vehicle. There are some big rig sites on the water. There is free wifi, but it is spotty. Verizon signal was strong. Satellite tv is not a problem as there are no trees. Each site has a picnic table and fire ring. Fire rings are away from the sites and near the water. Picnic tables can be moved to the site. The ideal site is #12 because there is only one site next to this one. Secondary choices would be 12A & 12B right on the water. There is a beautiful view of the bay. Sunsets are spectacular. The park is a short 1+ mile drive to the town of Lubec. We camped at Sunset Point RV Trailer Park in a Motorhome. Campobello is about 6 miles from the park across the short international bridge (need passport). See Roosevelt Campobello International Park and definitely have "Tea w Eleanor"!! That is a must. The two cottages are wonderful and the docents have lots of information about them and the families that lived there. Everyone gravitates to the Fisherman's Wharf for lobster, and it WAS good, but the best restaurant in town is the Water Street Bar & Inn. Delicious food, and tremendous service. 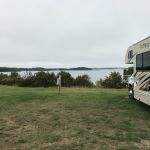 We spent 3 days exploring the area, including a trip to Campobello Island and the Roosevelt Cottage, which is a short drive from the campground over the bridge in to New Brunswick, Canada. Go to the West Quoddy light and over to Campobello Island. HD Seafood just down the road was great. Fresh and friendly. Visiting FDR's home in Campobello is fun. Be sure to take your passports! Make the trip over to Two River's Lobster Co. You can buy lobster right at the wharf and the campground provides everything you need to cook them. It's a lot of fun! The Roosevelt Campbell International Park is wonderful, if you can get tickets for the Eleanor Tea, do it, that is special. The Head Harbour Lightstation was special at low tide. The West Quoddy State Park is the furtherest East Point of the U.S., don't miss that. Lubec itself is looking like it is trying to come back to life, a few good restaurants are there. Visit Quady Lighthouse, the North Eastern most in the US. Travel to Campobello Island, New Brunswick, Canada. Don't forget your passports. Visit FDR's "Cottage" on Campobello Island. Campobello Island, FDR Summer Cottage, Quoddy Head (also known as West Quoddy) Lighthouse, East Quoddy Lighthouse and State Park - be sure to take the bog walk, Peruvian Chocolate store across street from campground, Uncle Kippy's, little roadside stand on left after Uncle Kippy's has the BEST smoked salmon dip. Shop around for whale watching tour prices. We paid double in Lubec for the same tour we could have got at a place on Campobello Island. The Roosevelt-Campobello International Park is wonderful and well worth visiting. Visit Campobello Island and the FDR International Peace Park (bring your passports), take a whale watching cruise (Downeast Charters), eat lobster! Visit Campobella, NB right across the bridge from Lubec. There are several lighthouses in the area also. We stopped for lunch at Family Fisheries restaurant on Campobella. The seafood chowder was excellent. Are you affiliated with Sunset Point RV Trailer Park ?